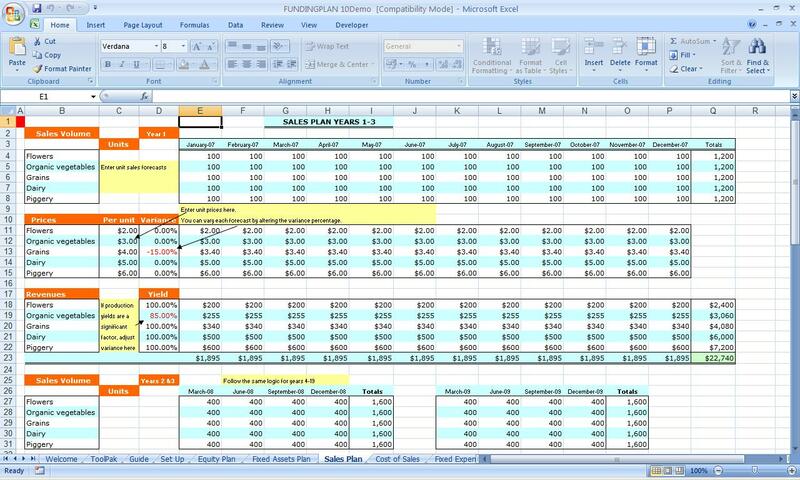 Funding Plan PRO for Excel provides the perfect financial planner for any 10 year projection. Compatible with Excel 97 and above. The download zip file contains a Dollar version, a Euro version and a Tutorial version. You need no accounting knowledge, Funding Plan provides ready made templates to create the profit/loss forecasts, balance sheets, cash flows, loan repayment schedules and the overall summary from your starting ten year projections in very professional looking presentations. You can use Funding Plan PRO as a quick financial modeler of your business. Variables can be adjusted anyway you want and as you know Excel will translate any input change instantly into the appropriate outcome. Monthly equity plan (Common share issues & financing). 3 Loan notes (Loan finance). Five depreciation classes (any useful life periods from zero upwards). Sales plan incorporating unit volume projections (any types of units), price per product and cost of sales per product. You can vary volumes and prices by any percentage value control to produce best case, expected case and worst case projections. Company expenses - straightforward monthly expense templates. Expenses are divided into six separate categories (Personnel, G&A, Marketing.....). Category expenses are summarized in the P/L schedules. You can change the category title headers any way you want. Working capital variables include Days sales outstanding, Days inventories outstanding, Percentage payable to sales. You can change any assumption to produce best, expected and worst cases again. Your inputs are instantly converted into monthly income (proft/loss) statement forecasts. Each annual forecast contains federal and state tax rate assumptions, dividends, exceptional expenditures and financing costs (if any). Your inputs are converted into monthly balance sheets covering the ten year period. Your inputs are converted into monthly cash flows covering the ten year period. Cash flow projections are divided into operating cash generated, investment capital expenditures and financing capital. The overall summary collects all your the key inputs and outputs forecasts as a 10 year summary of Prices, Yields and COS, Sales, Operating margins and Company expenses, Gross margins, EBITDA, Break even sales revenue, year end Receivable, Payable and Inventories, year end loan balances, free cash flows, year end cash positions and company value based on EBITDA multiples. All spreadsheet pages are optimized for printing and presentation in landscape. Two files are available in the zipped download, the tutorial file and the complete workbook. Financial Statement Forecasting PRO $139.95. Secure Payment Options Or, buy as part of All Excel Templates Gold Edition - HUGE Value - 80% Discount! Special! Free Choice of Complete Excel Training Course OR Excel Add-ins Collection on all purchases totaling over $69.00. ALL purchases totaling over $150.00 gets you BOTH! Purchases MUST be made via this site. Send payment proof to [email protected] 31 days after purchase date.